I don’t know if any of you have been to Great Wolf Lodge, but if you’re wondering what it’s like, imagine Las Vegas in all its blinking, garish glory, only instead of empty liquor cups everywhere there are empty froyo cups everywhere. It also is probably the only place in the world where you check out at ham o’clock. Remember how Pinnochio grows a set of ears when he plays hooky to go to Toyland? Guess what they give the kids the minute you check in at GWL. At the check-in desk, they pipe in some kind of smell that makes parents weak and vulnerable and you end up buying the $50 passes that include a magic wand, mini golf, 20 arcade points, a walk through a mirror maze, a scoop of ice cream, a cup of bulk candy, and “free” entry to the high ropes course—which, after all the things that came before it, is really just a death threat. The first thing you do is take the kids to the indoor water park, where if you are holding your son’s hand, you are too far away for him to hear you. The kid whose hand your are holding declares he doesn’t like water and wants to watch TV in the room. You pretend you can’t hear him, which you actually can’t. 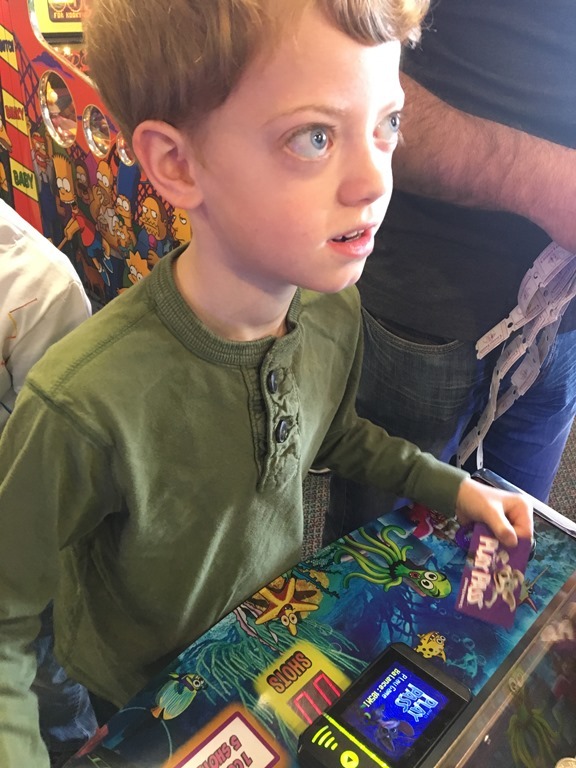 You spend two hours hours looking for the other kids until you finally give up and hope that whatever families they ended up with are nice ones. Then, out of nowhere, your other children show up, wondering why you look so irritated. You are so exhausted you take everyone to the room to watch TV. Then the boys want to go cash in all those things on their “paw passes,” so you start looking for those nice families they found earlier to maybe take care of that for you, but when you open the door, all you see are children. So many, many children. Where did all the adults go? Is it even safe for adults here?! The boys, of course, loved it. 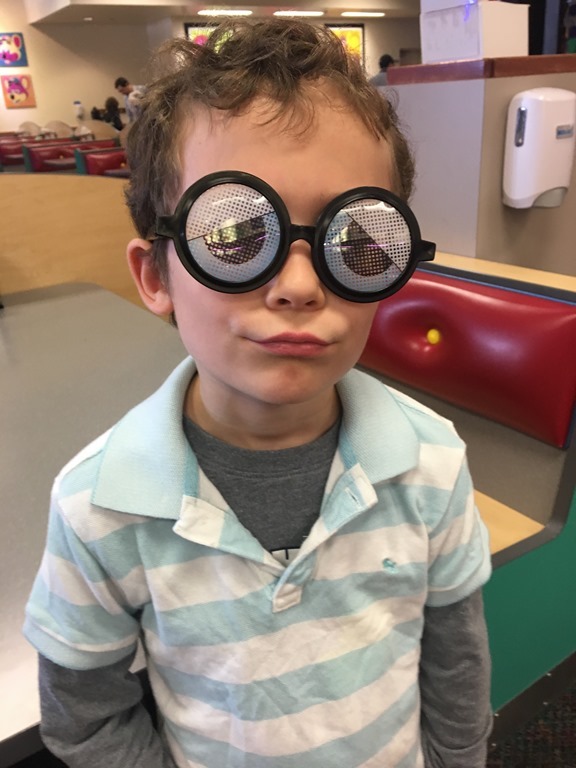 They loved their wolf ears, loved the magic quests, loved the two arcade games that 20 points bought them, loved all 90 seconds of the mirror maze, and especially especially loved the scoop of ice cream and the cup of cavities their passes got them. And I thought of us all right there, eating cheeseburgers, my boys looking at me with big eyes, wanting to know if I had a good time at the water park, so I told him the truth. I did. I really, really did. I actually don’t know. I don’t know what I’m cooking tonight! This is so weird! I got a non-form rejection letter for one of my picture books manuscripts!!!!!!!! Thank you so much for sending NOBODY LIKES ME. It’s a great pitch and story idea, but unfortunately, I didn’t fall in love with this draft as much as I would need to take on the project. For that reason, I am going to step aside for now, but I truly appreciate the opportunity to consider your work. I wish you the very best of luck with this and all of your projects! Do you all know what this means? It means someone LIKES me!!! 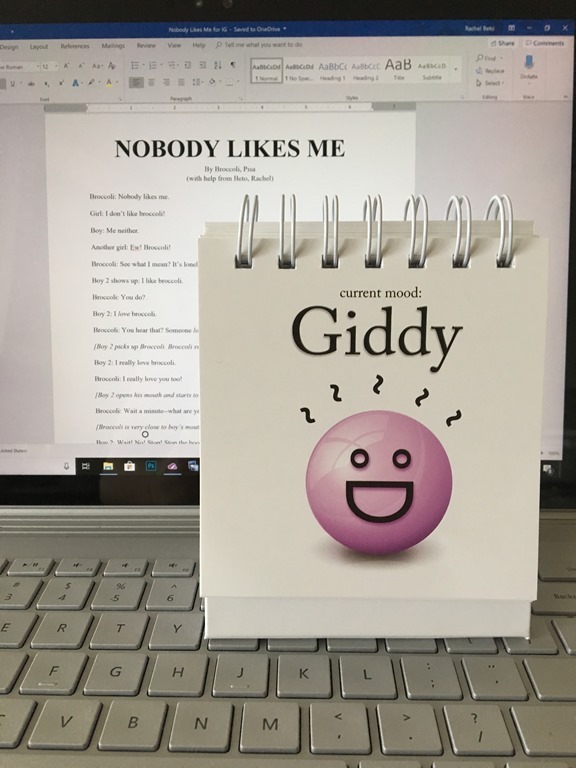 Someone likes me for writing a book called Nobody Likes Me! Tr, it’s not like she’s inviting me over so we can play Barbies and braid each other’s hair, but we’re getting closer. Plus, she truly appreciates the opportunity to consider my work! 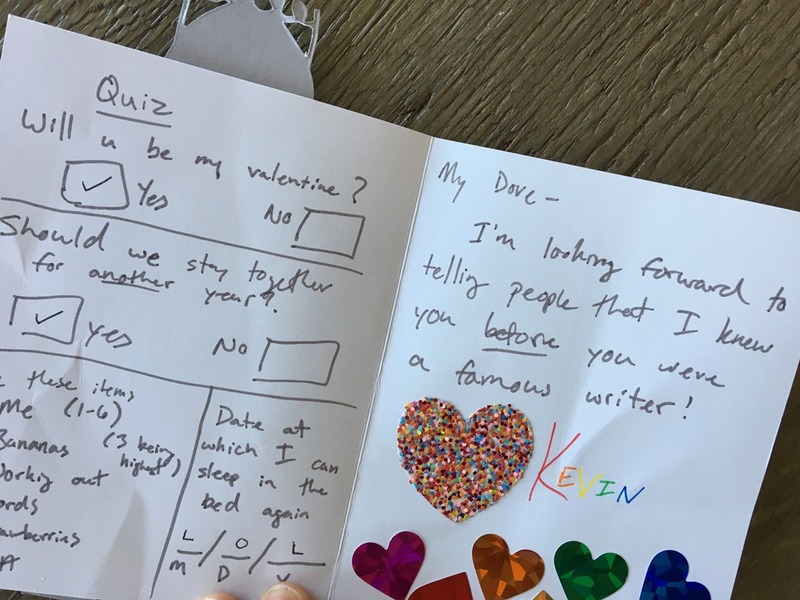 Now you might read this and want to pat my arm lightly and sit me down and explain that this isn’t all that nice of a letter and am I sure it’s not just a form? But I say to thee yes, yes I’m sure! And I should know because I’ve gotten so many, many form rejections for other manuscripts. She used my name! I am not “sir” or “ma’am” or “contributor.” Nay, I am Rachel! And I have a great pitch and story idea! So what does this all mean? Where do I go from here? I don’t know. All I know is that I am going to sit here and bask in the glory of this non-form rejection letter for as long as its glory holds out. My kids are into this thing called gaga ball at recess. You probably don’t know what gaga ball is unless you’re a cheater, in which case you probably do know what gaga ball is. The minute the boys get off the bus they want to tell us all about the cheaters who played gaga ball that day. It’s kind of uncanny, how everyone who plays gaga ball except my two sons happens to be a cheater. Uncanny! 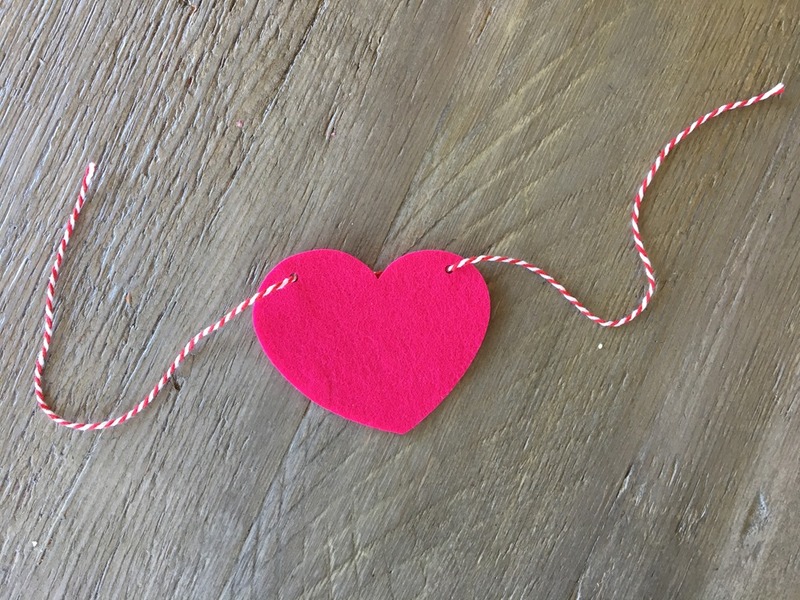 Anyway, Leo made some detailed instructions about how to play, so everything you need to know is right here in this blog post. 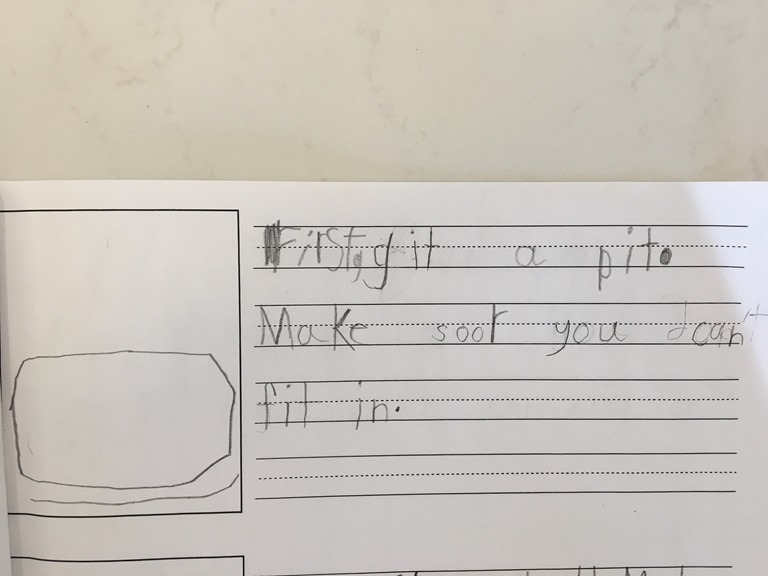 First, git a pit. Make soor you don’t can fit in. 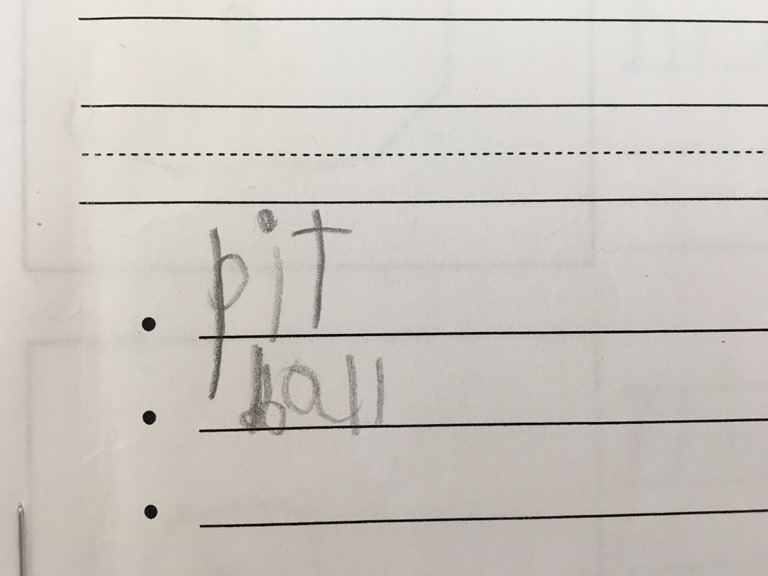 Then git a ball. 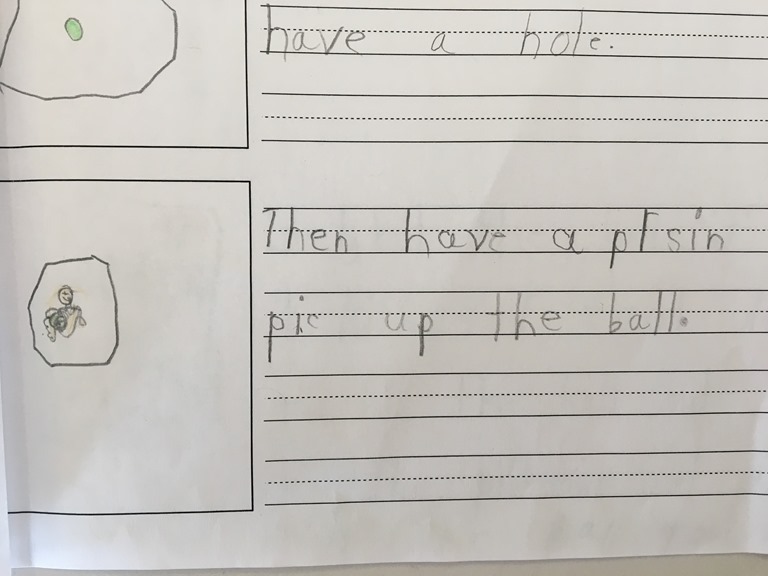 Make shoor the ball dusnot have a hole. Then have a prsin pic up the ball. Then have some peeple come in. dont get hurt comeing in. And there you have it, gaga ball! You probably didn’t even finish reading this whole post because you ran out to the store to buy a pit, you were so excited! But I hope you did not do that because you have to hear about the dark side of this game before making any rash decisions like buying a pit. Like how last Monday the gaga pit got closed down because someone puked in it. The next day, someone popped a bloody nose in there (but the pit remained open). 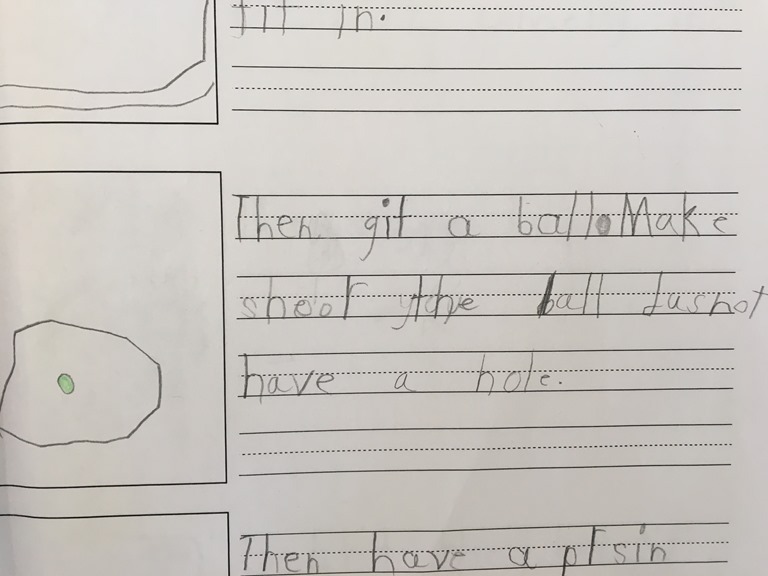 The following day, one kid got so mad when he got out that he kicked another kid, who starting spouting off the F word, and when they finally got the first kid to go out, he threw rocks at the kids in the gaga pit. Rocco had a microscopic red mark on his neck as proof. He was very proud of his microscopic mark. 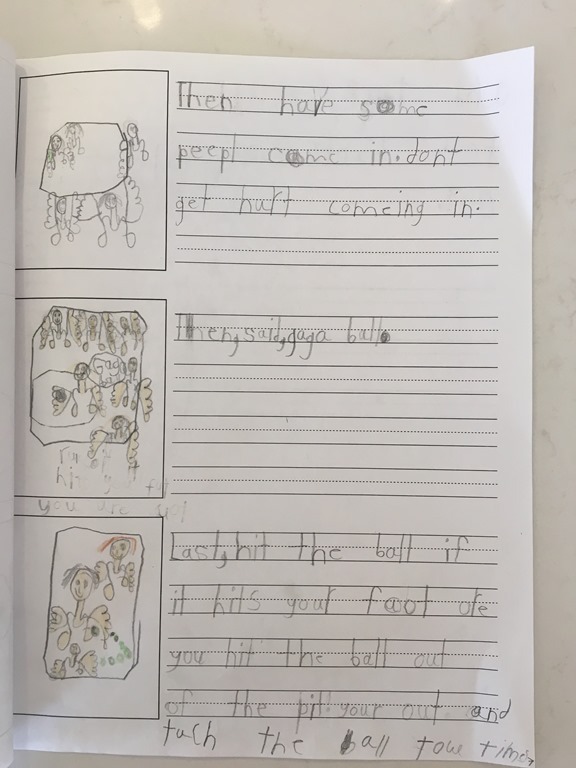 He said he got hurt twice as much as any other kid because the rock hit his neck, then bounced up and hit his chin, so he got hit twice. So let us all take heed and not let ourselves be fooled by the adorable drawings and sweet, childlike instructions for gaga ball given above. These are actually plans for the destruction of humankind as we know it. I urge you to delete this blog post from your cookies and pretend you never read it. And for goodness sakes, take that pit back to the store! What were you even thinking?! 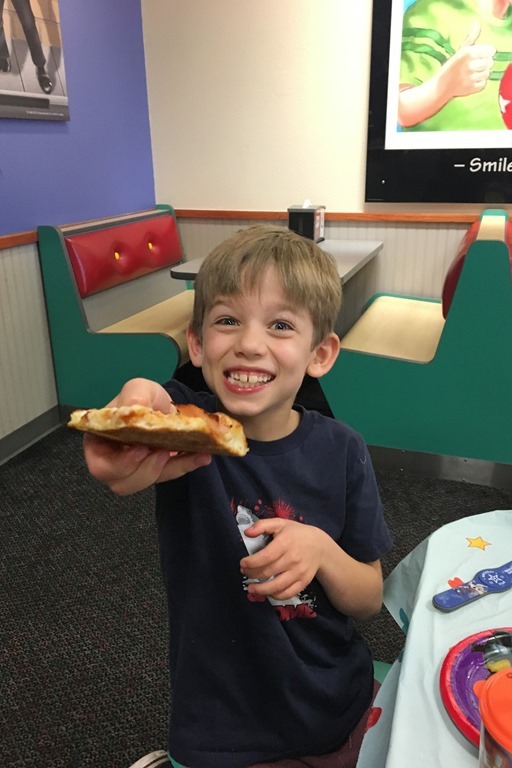 We finally had Leo’s 7th birthday party, at Chuck E Cheese for the second year running. (I reject the apostrophe s from their name). Last year we got the cheapest package, so every kid got 20 tokens. This year we went a different route and got the kids unlimited tokens. Unlimited! 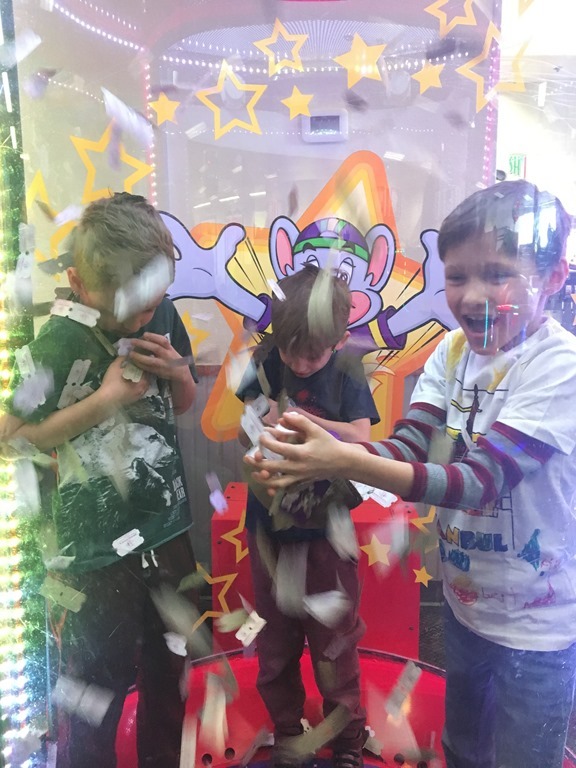 Now normally, the kids have to budget their tokens and choose their games carefully according to which last the longest, which are the most fun, and which have the biggest payoff for the least tokens. It’s a whole different ball game when you have unlimited points, and it didn’t take long for the kids to figure this out. It was reminiscent of the grocery store game shows of the 80s, with kids frantically swiping their cards at any game that crossed their path, like a wild-eyed mom sweeping an entire cereal aisle into her cart, Froot Loops, Grape Nuts, and all. The boys adjusted to this limitless world frighteningly well. Leo designated my sister as his official ticket holder and she followed along behind him, gray tickets dripping off her like pearl necklaces until he ditched her for a grocery bag. She was later seen crouched beside a machine, scanning her son’s card over and over so he could play a game faster. 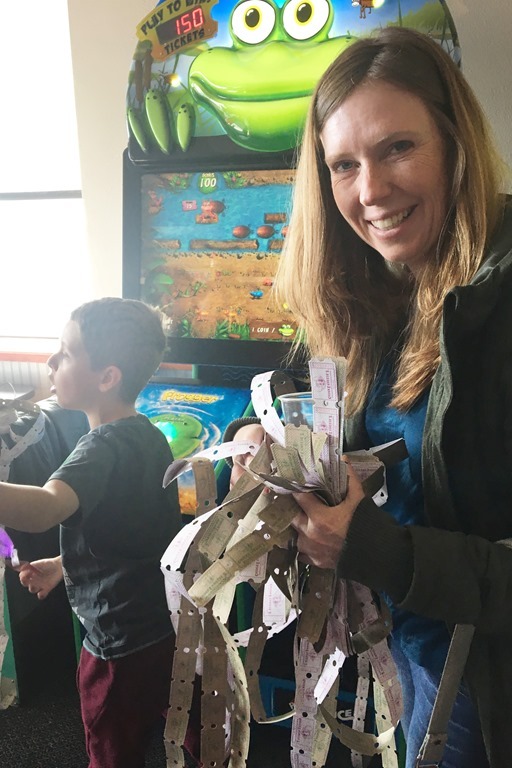 When it was time for pizza, one girl sent her mom off to play games so the tickets would keep coming while she ate. Vincenzo came over to tell me he broke a game by playing it so many times that it ran out of tickets. *Not my sister. Just another proud parent of a BIG WINNER!!!!!! It was Leo’s second year in the ticket tornado thing and he was supposed to invite one friend in but another squeezed his way in, too, because it was just that kind of party. Leo was ready this year with a baseball hat, which had better results than shoving them down his pants like he did last year. 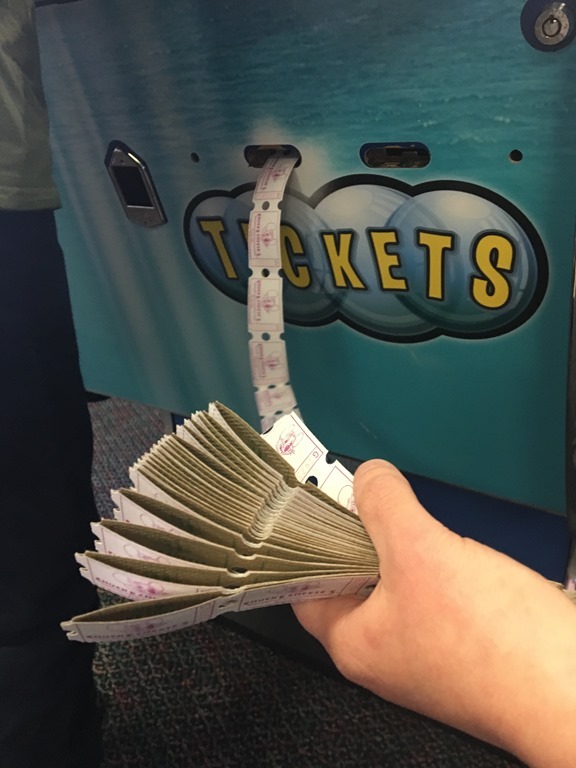 When the two hours were up, our kids took over the ticket muncher machine, feeding it line after line after line of tickets while the numbers climbed into the hundreds, then into the thousands. The thousands! So the kids went on a shopping spree. My boys teamed up with their cousin to buy an inflatable soccer net and ball, and if you think that’s a pretty good find, you are gravely mistaken. We found one on-line for $5.00, which was about twice what it was worth. Leo dropped a couple thousand on a mini knock-off Nerf gun with three bullets. Then when a friend came over, he gave it away, like a couple thousand points of tickets is pocket change to him. So yeah. It was a crazy two hours, and if the party had a theme like all my parties used to, the theme of this one would be gluttony. In conclusion, I am sending the video clips of Leo’s 7th birthday to Hollywood so they can splice them together and make a Hangover 4. 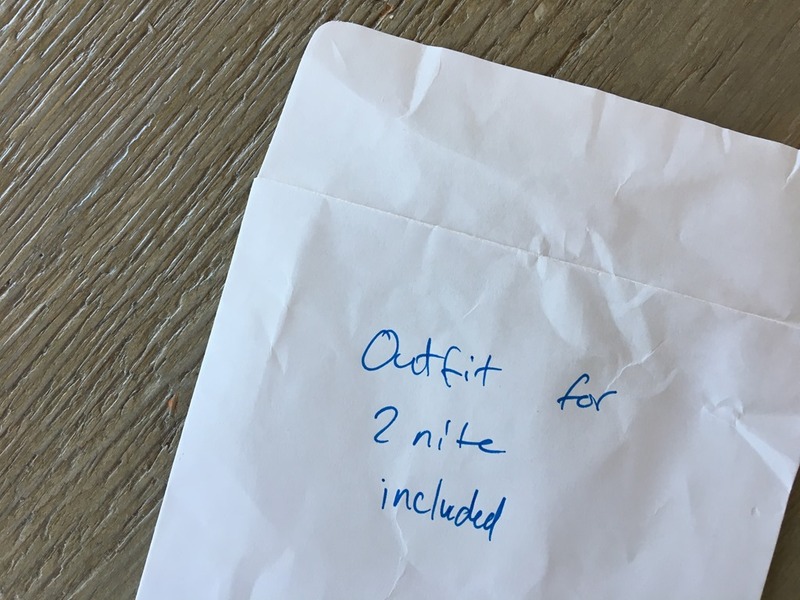 That’s what kind of party it was. I went to a nutritionist yesterday about some really nasty canker sores and now I need a new coat. It’s like this: I’ve been dealing with some truly terrible canker sores lately. Actually, it started about 10 years ago when toothpaste began making my mouth explode in canker sores. I switched toothpastes and life went back to normal. Fast forward a few years and suddenly artificial sweeteners started causing riots of canker sores in my mouth, so I stopped drinking diet soda. It was crazy hard. There should be an AA thing for people who have to give up diet soda. Fast forward to last year and coffee started doing it. Coffee. Even one sip of coffee turns my mouth into a battle ground. Two sips and my tongue swells up as an encore. This was bad, guys. This was really bad. And now, as of last week, my mouth can’t handle citrus fruits, pineapple, or tomatoes. I have become one of those people who sends you a list of foods I can’t eat if you invite me over to dinner. Which you probably won’t. So, yeah. Canker sores are stupid. My mouth is stupid. So I decided to go to a nutritionist. I had never been to a nutritionist before and thought it would kind of be like a doctor’s appointment, minus the lab coat, plus some smelly candles. Bless her, I think this nutritionist was as surprised by me as I was of her. She kept saying she didn’t want to do anything that made me uncomfortable. Absolutely everything that happened next made me uncomfortable. Like when she said she wanted to stick needles in my ears. I told her I was uncomfortable. I was very uncomfortable! She held my feet and said some calming words and then asked if I felt more comfortable now and I said, “Just do it. Just do it and don’t tell me about it.” So she did. As I lay there, wondering what I looked like with needles poking out of my ears, she told me to access my childhood Rachel. “Ask her what Little Rachel wants.” Then she wanted me to tell her what Little Rachel, so I answered truthfully that Little Rachel said she wanted a scoop of Rainbow Sherbet. We had an awkward convo about Rainbow Sherbet vs Daiquiri Ice while the she worked to reverse the flow of energy in my body so my canker sores would go away. Then she said, “Your eyes are very open,” because I guess most people close their eyes when other people start sticking needles into their ears, and she asked what I was thinking about now. I told her there was this really cool bump on her ceiling that I was thinking about, because that’s what I was thinking about. She told me maybe I should close my eyes for a bit. Then I started thinking about this creepy date I had in college where I knew within two minutes of showing up to the guy’s house that I had made a mistake, but I politely stayed for dinner—and also to because neither of us had a car and his roommate with a car was supposed to be there but for some totally legit reason was not. Then, due to a miscommunication, he ended up trying to give me a massage, at which point I remembered BUSES! There are BUSES that go by here! And I high-tailed it out. Kevin asked me if I’ll be going back to the nutritionist and I told him if I ended up naked and with needles sticking out all over my body on our first date, I can’t even imagine what would happen on our second date. No; I won’t be going back. Except that she called an hour after the appointment to say I had left my coat there and I could come by in the next hour to pick it up. It’s time to get a new coat. Sometimes I feel like this blog is one of those devices that sends pings out into space just in case some aliens happen by and hear the pings, even though that’s a fairly ridiculous notion. But I love the fairly ridiculous, so here I am, sending out another round of blips. I’m delving into family life today, so let me give you the run-down on all the other Mouthies. Vincenzo, is slowly, sloooowly pulling his grades up this quarter. * Of course, two of his classes are PE and this week he has a hurt hand so I’m not sure how long he can hold onto those As. (Get it? Hold on? With a hurt hand?) Vincenzo has learned to resist my Type A tendencies as bad as Kevin has though. Like the other day, I learned that his friend, who is also 13, is on the board, the board, for Water First, which got me to thinking about how Vincenzo doesn’t volunteer for anything, which got me to telling Vincenzo he should think about volunteering for something, which made Vincenzo say, “Is this about my friend being on the board for Water First,” which made me say, “No! What makes you think that? !” Then Vincenzo volunteered to eat the first brownie out of the pan I had just set on the counter. He then told Leo he could eat the second and Rocco he could eat the third, and then he started calling himself a volunteer coordinator. I just shook my head and walked away. How can you work with that?! Leo is starting to outgrow his snuggly phase, which is absolutely killing me. Actually, he outgrew it in a two day time span when he started screaming or saying I hurt him every time I gave him a hug or kiss, and that was pretty much that. He’s so darn cute still that it takes a herculean amount of willpower not to try anyway. But he’s not all the way grown up yet. He still says, “I’m make sure-ing to do my homework.” So there’s that. 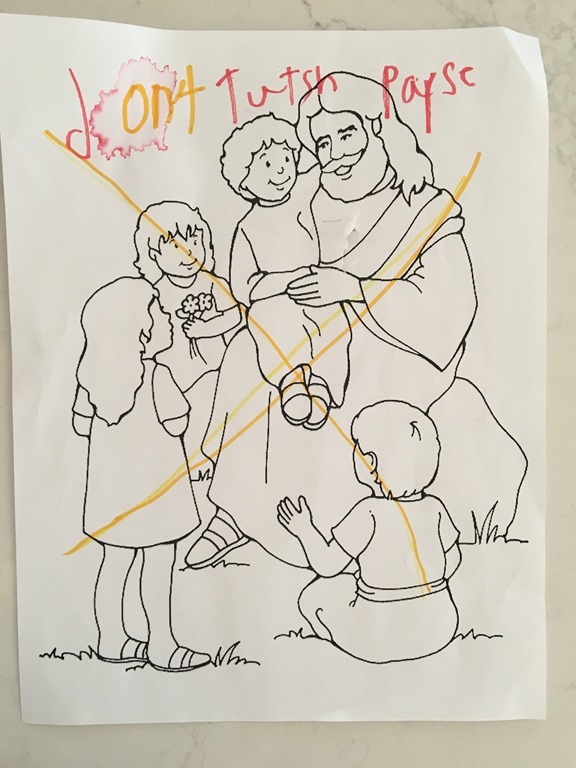 At Sunday school, he did such a nice job coloring the handout again. At first we thought he was being unchristian, telling others not to touch the paper. But then we talked ourselves into believing he did it for the good of others. Maybe the paper has cholera on it, and he’s trying to save everyone! Or typhoid! Or at the very least, someone could get a nasty paper cut if they touched the paper. Leo is a freaking humanitarian. 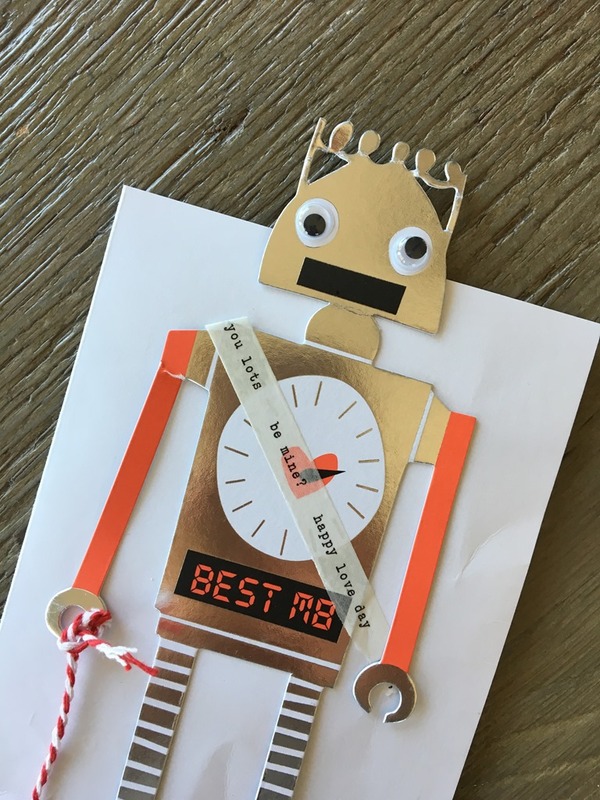 The robot’s holding a pencil on a string because there were some questions to answer inside the card. There were also a lot of rainbow heart stickers. As I opened it, he told me proudly he made it himself. He started to demonstrate how to put it on but I snatched it up and told him I love my new bookmark. So, I hope you have enjoyed this foray into the family life of Mrs. Mouthy. Please seek out my blips floating around space again. *A couple hours after writing that, I check V’s grades and saw he has gotten 5 straight F’s in English, so yeah. But I’m leaving that sentence there to remember that for a short period of his life, he was getting okay grades and I was not breathing fire down his neck.